Haynes Group is the most responsive and reliable, solutions-driven provider of labour hire and equipment management, servicing, and maintenance in today’s market. They came to us for revamping their existing website that reflected their modern branding. 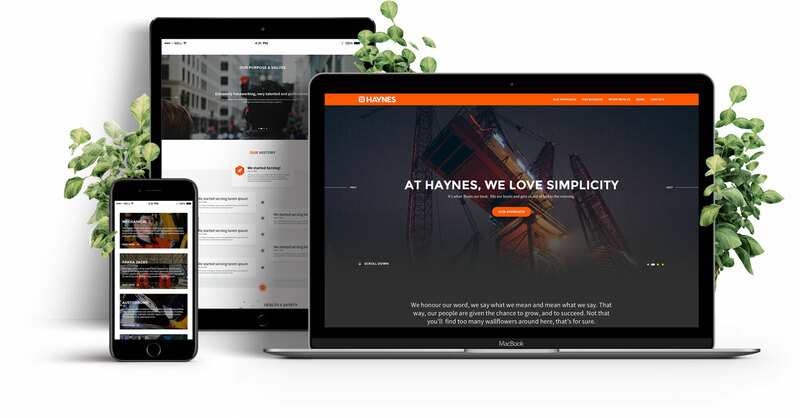 Haynes wanted an outstanding digital agency to revamp their existing website. Our challenge was to develop a premium yet minimal responsive website that reflected their uplift on brand design keeping in consideration the variable content types. Their service domains and core values needed to be prominently visible across the website. We focused on mobile first. We used large imagery that portrayed life and culture of Haynes group. Our visual approach incorporated brand focused color pallet, subtle interaction effects and correct white-spaces that produced a premium aesthetic across the screens of all the sizes. We built the website on Drupal as it is one of the most secure open source content management system. Haynes group now owns a clean, beautiful and robust website that works on the all the devices. The intuitive user experience and ultimately simple user interfaces pops out their services and core values engaging and driving visitors through an information-rich narration.